There are so many festivals and vrats throughout the year, that it pays to have a host of naivedyams and fasting foods handy, so that we don’t end up making the same ones over and over again. And you know I look for the simplest of dishes that won’t go wrong even if I don’t follow the recipe to the T and which are easy to boot! In this category of dishes falls payasam or kheer, and it goes without saying that it is a favourite of mine! 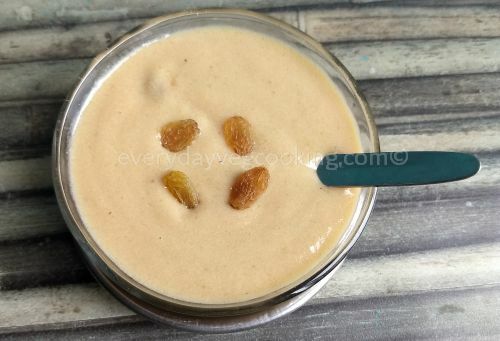 In addition to the rice kheer that is everyone’s favourite, there are any number of payasams that can be made easily using jaggery or sugar or even dates for sweetening. I had shared a version of pumpkin kheer earlier. You can try this easy-peasy kheer for naivedyam on one of the days this Navaratri. Drain the water from the rice and grind it along with coconut into a fine paste. Add a little water if needed. Add a cup of water and cook it in a heavy-bottomed pan on a slow flame till the rice is cooked and the mixture thickens. Stir intermittently and take care to see that it doesn’t stick to the bottom of the pan. Add the jaggery and let it melt and combine with the coconut-rice mixture. Stir occasionally. Once it combines well, add the milk and cardamom and mix well. 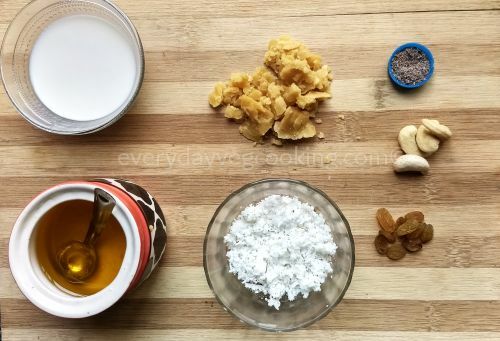 In a small pan heat the ghee and fry the cashews and raisins. Add to the kheer and enjoy hot or cold – after offering the naivedyam, of course!. You can use readymade coconut milk or use ½ cup regular milk. Add more milk to adjust the consistency. With very few ingredients you have prepared delicious dish, very often I make chawal ki kheer but next time I will try this recipe . Wow ! Simplicious ( just coined by me meaning : simple yet delicious ) ! Have to try it out..
Knowing me, you can rest assured that my recipes will all be super simple, even when I give a big list of ingredients 🙂 Try it out and tell me if you liked it.